What is the purpose of suspension? As we review suspension system components and how they work together, remember that a vehicle in motion is more than wheels turning. As the tire revolves, the suspension system is in a dynamic state of balance, continuously compensating and adjusting for changing driving conditions. Today's suspension system is automotive engineering at its best. However, in order for this to happen, all the suspension components, both front and rear, must be in good working condition. At this point, it's important to understand that the main components of a moving vehicle suspension system are the Struts, Shock Absorbers, Springs and Tires. We will first turn our attention to the design and function of springs. In the following section we will thoroughly examine the function and design of shock absorbers and strut assemblies. The springs support the weight of the vehicle, maintain ride height, and absorb road shock. Springs are the flexible links that allow the frame and the body to ride relatively undisturbed while the tires and suspension follow the bumps in the road. Springs are the compressible link between the frame and the body. When an additional load is placed on the springs or the vehicle meets a bump in the road, the springs will absorb the load by compressing. The springs are a very important component of the suspension system that provides ride comfort. Shocks and struts help control how fast the springs and suspension are allowed to move, which is important in keeping tires in firm contact with the road. During the study of springs, the term bounce refers to the vertical (up and down) movement of the suspension system. The upward suspension travel that compresses the spring and shock absorber is called the jounce, or compression. The downward travel of the tire and wheel that extends the spring and shock absorber is called rebound, or extension. When the spring is deflected, it stores energy. 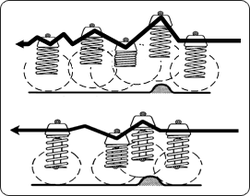 Without shocks and struts the spring will extend and release this energy at an uncontrolled rate. The spring's inertia causes it to bounce and overextend itself. Then it re-compresses, but will again travel too far. The spring continues to bounce at its natural frequency until all of the energy originally put into the spring is used. If the struts or shock absorbers are worn and the vehicle meets a bump in the road, the vehicle will bounce at the frequency of the suspension until the energy of the bump is used up. This may allow the tires to lose contact with the road. Struts and shock absorbers that are in good condition will allow the suspension to oscillate through one or two diminishing cycles, limiting or damping excessive movement, and maintaining vertical loads placed upon the tires. This helps keep the tires in contact with the road. By controlling spring and suspension movement, components such as tie rods will operate within their design range and, while the vehicle is in motion, dynamic wheel alignment will be maintained. 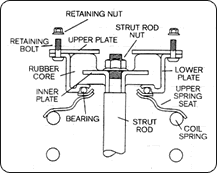 Before discussing spring design, it is important to understand sprung and unsprung weight. Sprung weight is the weight supported by the springs. For example, the vehicle's body, transmission, frame, and motor would be sprung weight. Unsprung weight is the weight that is not carried by springs, such as the tires, wheels, and brake assemblies. The springs allow the frame and vehicle to ride undisturbed while the suspension and tires follow the road surface. Reducing unsprung weight will provide less road shock. A high sprung weight along with a low unsprung weight provides improved ride and also improved tire traction. There are four major spring designs in use today: coil, leaf, torsion bar, and air. 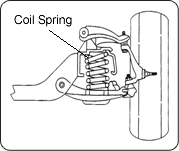 The most commonly used spring is the coil spring. The coil spring is a length of round spring steel rod that is wound into a coil. Unlike leaf springs, conventional coil springs do not develop inter-leaf friction. Therefore, they provide a smoother ride. The diameter and length of the wire determine the strength of a spring. Increasing the wire diameter will produce a stronger spring, while increasing its length will make it more flexible. Spring rate, sometimes referred to as deflection rate, is used to measure spring strength. It is the amount of weight that is required to compress the spring 1 inch. For example: If it takes 100 lbs. to compress a spring 1 inch, it would take to 200 lbs. to compress the spring 2 inches. Some coil springs are made with a variable rate. This variable rate is accomplished by either constructing this spring from materials having different thickness or by winding the spring so the coil will progressively compress at a higher rate. Variable rate springs provide a lower spring rate under unloaded conditions offering a smoother ride, and a higher spring rate under loaded conditions, resulting in more support and control. Coil springs require no adjustment and for the most part are trouble-free. The most common failure is spring sag. Springs that have sagged below vehicle design height will change the alignment geometry. This can create tire wear, handling problems, and wear other suspension components. During suspension service it is very important that vehicle ride height be measured. Ride height measurements not within manufacturer's specifications require replacement of springs. Leaf springs are designed two ways: multi-leaf and mono-leaf. The multi-leaf spring is made of several steel plates of different lengths stacked together. During normal operation, the spring compresses to absorb road shock. The leaf springs bend and slide on each other allowing suspension movement. An example of a mono-leaf spring is the tapered leaf spring. The leaf is thick in the middle and tapers toward the two ends. Many of these leaf springs are made of a composite material, while others are made of steel. Another type of spring is the torsion bar. The torsion bar is a straight or L shaped bar of spring steel. Most torsion bars are longitudinal, mounted solidly to the frame at one end and connected to a moving part of the suspension at the other. Torsion bars may also be transverse mounted. During suspension movement, the torsion bar will twist, providing spring action. The air spring is another type of spring that is becoming more popular on passenger cars, light trucks, and heavy trucks. The air spring is a rubber cylinder filled with compressed air. A piston attached to the lower control arm moves up and down with the lower control arm. This causes the compressed air to provide spring action. If the vehicle load changes, a valve at the top of the airbag opens to add or release air from the air spring. An onboard compressor supplies air. An often-overlooked spring is the tire. Tires are air springs that support the total weight of the vehicle. The air spring action of the tire is very important to the ride quality and safe handling of the vehicle. As a matter of fact, tires may be viewed as the number-one ride control component. Tire size, construction, compound and inflation are very important to the ride quality of the vehicle. There are three basic types of tires: radial ply, bias ply, and bias belted. Radial ply tires have ply cords, which run across the centerline of the tread and around the tire. The two sets of belts are at right angles. Some belts are made of steel wire; others are made of polyester or other substances. Today, radial tires come as original equipment on most passenger cars and light trucks. 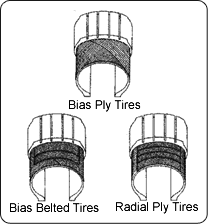 Bias ply tires use cords that run at an angle across the centerline of the tire tread. The alternate ply cords cross at opposite angles. Bias belted tires are the same as bias ply, with the addition of layers of cords - or belts - circling the tire beneath the tread. Both of these types of tires will most likely be found on older model vehicles. The air pressure determines the spring rate of the tire. An over inflated tire will have a higher spring rate and will produce excessive road shock. Over inflated tires will transmit road shock rather than reduce it. Over or under inflation also affects handling and tire wear. When adjusting tire pressure, always refer to the vehicle manufacturer's specifications, not the specification on the side of the tire. The air pressure specified by the vehicle manufacturer will provide safe operation and best overall ride quality of the vehicle. The tire pressure stamped on the side is the maximum pressure a tire is designed to hold at a specific load. Strut mounts are vehicle specific, and there are numerous designs in use today on both front and rear suspension systems. The three most common designs are inner plate, center sleeve, and spacer bushing. The Inner Plate Design used by General Motors and some Ford applications feature an inner plate encased in molded rubber surrounded by upper and lower surface plates. The inner plate is designed so the strut piston rod cannot push through the upper or lower surface plate if the rubber core fails. This design generally does not require washers. Due to the fact that the upper and lower service plates mostly cover the rubber portion of the mount, it is difficult to see if the inner rubber bushing has failed. However, these components wear over time and with a thorough inspection a proper recommendation can be made. The bearing is located on the bottom of the strut mount and is not serviceable. Defective bearing will require replacement of the entire strut mount. The Center Sleeve Design used by Chrysler features a center sleeve that is molded to the rubber bushing. This design provides increased side to side stability. The strut stem extends through the center sleeve. Upper and lower retainer washers prevent the strut rod from pushing through the strut mount. The bearing is a separate component from the strut mount. If inspection reveals cracks or tears in the rubber bushing, replacement is required. If the bearing is found to be defective it can be replaced separately. The Spacer Bushing Design used by Volkswagen, Toyota, Mazda, Mitsubishi, and early Chrysler vehicles feature center positioning of the bearing and a separate inner bushing instead of a molded inner sleeve. The operation is similar to the style we just discussed except the bearing is pressed in the strut mount. The bearings, washer, and the upper plate retain the strut rod. 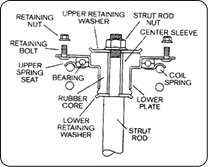 If the rubber bushing is cracked, torn, or the bearing is binding or seized, the strut mount requires replacement. Another important component of a suspension system is the anti-sway bar. This device is used along with shock absorbers to provide additional stability. The anti-sway bar is simply a metal rod connected to both of the lower control arms. When the suspension at one wheel moves up and down the anti-sway bar transfers the movement to the other wheel. In this way the sway bar creates a more level ride and reduces vehicle sway or lean during cornering. Depending of the anti-sway bar thickness and design, it can provide as much as 15% reduction in the amount of vehicle roll or sway during cornering. Bushings are used in many locations on the vehicle suspension system. Most bushings are made with natural rubber. However, in some cases, urethane compounds may be used. Bushings made of natural rubber offer high tensile (tear) strength and excellent stability at low temperatures. Natural rubber is an elastomeric material. Elastomeric refers to the natural elastic nature of rubber to allow movement of the bushing in a twisting plane. Movement is controlled by the design of the rubber element. Natural rubber requires no lubrication, isolates minor vibration, reduces transmitted road shock, operates noise free, and offers a large degree of bushing compliance. Bushing compliance permits movement without binding. Natural rubber resists permanent deflections, is water resistant and very durable. In addition, natural rubber offers high load carrying capabilities. As with all suspension system components, control arm bushings are dynamic components, meaning that they operate while the vehicle is in motion. Control arms act as locators because they hold the position of the suspension in relation to the chassis. They are attached to the vehicle frame with rubber elastomeric bushings. During suspension travel, the control arm bushings provide a pivot point for the control arm. They also maintain the lateral and vertical location of the control arm pivot points, maintain dynamic wheel alignment, reduce transmitted noise, road shock, and vibration, while providing resistance to suspension movement. During suspension travel the rubber portion of the bushing must twist to allow control arm movement. Control arm bushings that are in good condition act as a spring; that is, the rubber will spring back to the position from which it started. This twisting action of the rubber will provide resistance to suspension movement. As previously stated, control arm bushings are dynamic suspension components. As the control arm travels through jounce and rebound, the rubber portion of the bushing will twist and stretch. This action transfers energy into the bushing and generates heat. Excessive heat tends to harden the rubber. As the rubber bushing hardens, it tends to crack, break, and then disintegrate. Its temperature determines the life of a rubber bushing. Rough road conditions and/or defective shock absorbers or struts will allow excessive suspension movement creating more heat, which shortens the life of the bushings. Rubber bushings must not be lubricated with petroleum-based oil. A petroleum-based product will destroy the bushings. Instead, use a special tire rubber lubricant or a silicone based lubricant. Worn suspension bushings allow the control arm to change positions. This results in driveline vibration (primarily rear wheel drive rear control arm bushings), dynamic alignment angle changes, tire wear, and handling problems. 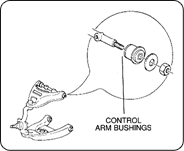 Control arm bushing wear (looseness) will create a clunking sound while driving over rough roads.